The crib was given to us by some wonderful, generous friends. 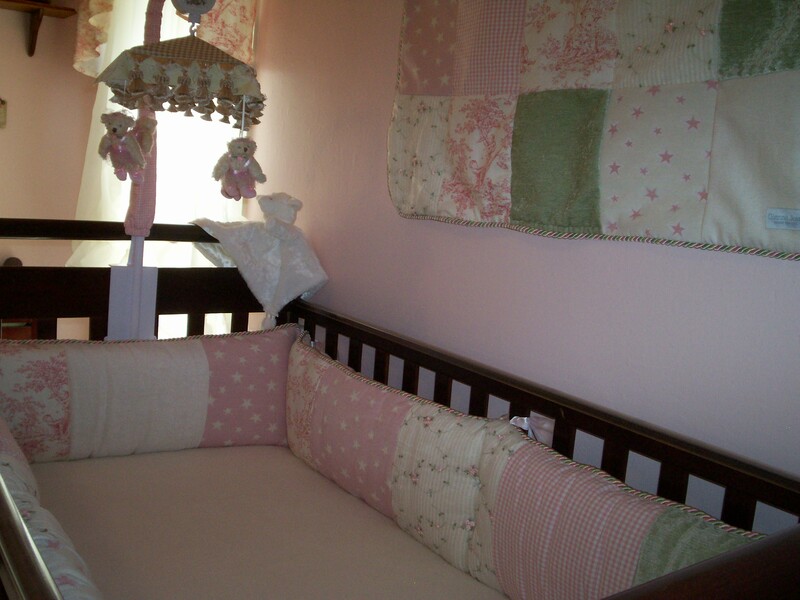 The crib bedding was a gift from my mom and mother-in-law. It’s the Isabella crib bedding set by Glenna Jean. 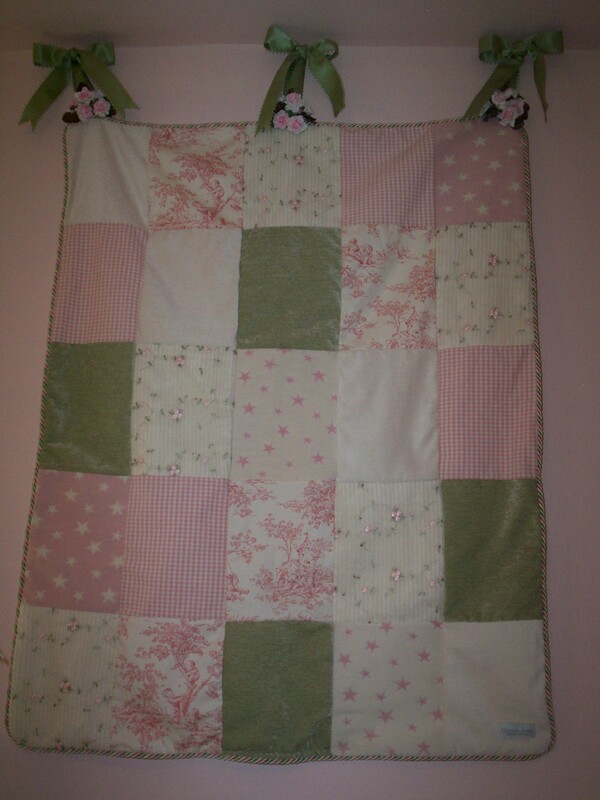 Hanging on the wall above the bed is the quilt that came with the set. 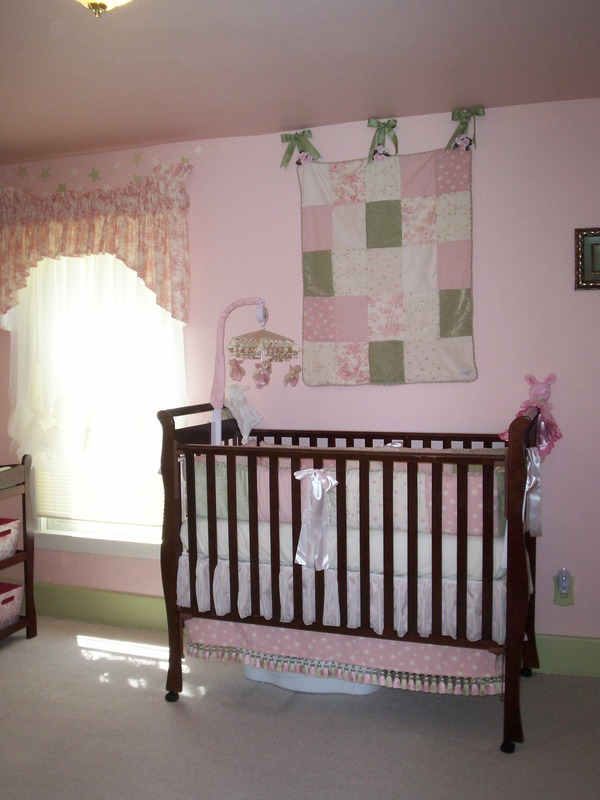 I knew we couldn’t put it in the crib with her and I didn’t want it to go to waste, so we hung it above the crib. 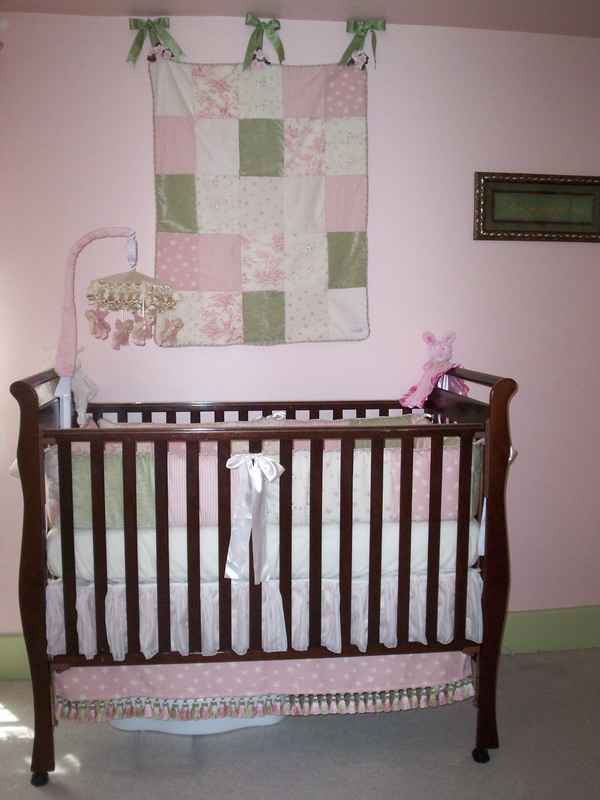 We moved the bumper once Adaline was born and put it underneath the crib decoratively. The mobile was a gift from my sister-in-law and is also a Glenna Jean, however, it is part of the Story Time collection because I thought the teddy bears on the Isabella mobile were kinda scary. 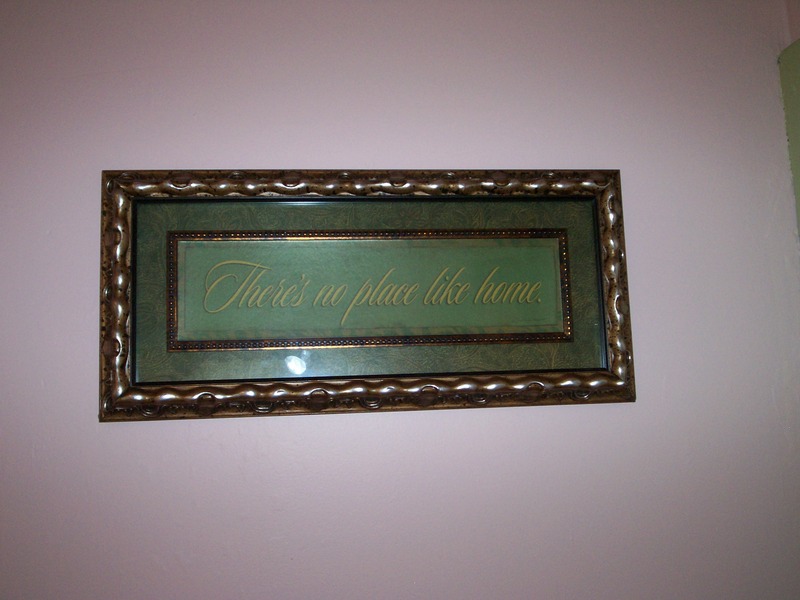 To the right of the crib is a “There’s no place like home” sign from The Hobby Lobby. We got the changing table at Target. 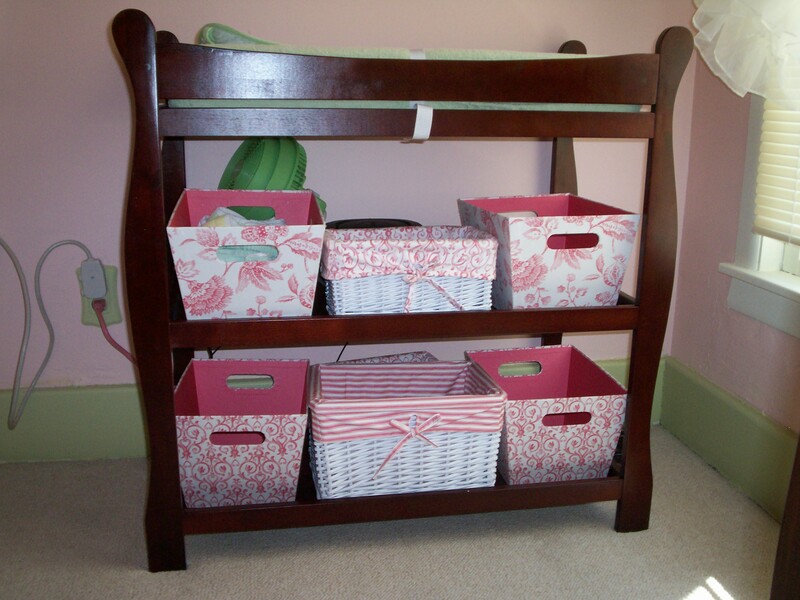 I purposely wanted something without drawers so that the diapering stuff would be easily accessible. I also wanted something with built in straps so that I would have a way to secure the baby. I know that a lot of people don’t use a changing table, but it ended up being a big help for me. I had a cesarean and it was too hard for me to get up and down from the floor and I couldn’t twist properly to change her on a sofa or bed. I also have a dresser/changer that was part of my baby furniture that my mom had saved. I put it in our family room downstairs and it was great for changing her and for storing baby junk without it cluttering up the living space. The changing pad is from Babies R Us. I got the baskets at Michael’s. The black and white bunny on the left and the black and white “Faith” blocks were from the Hobby Lobby. 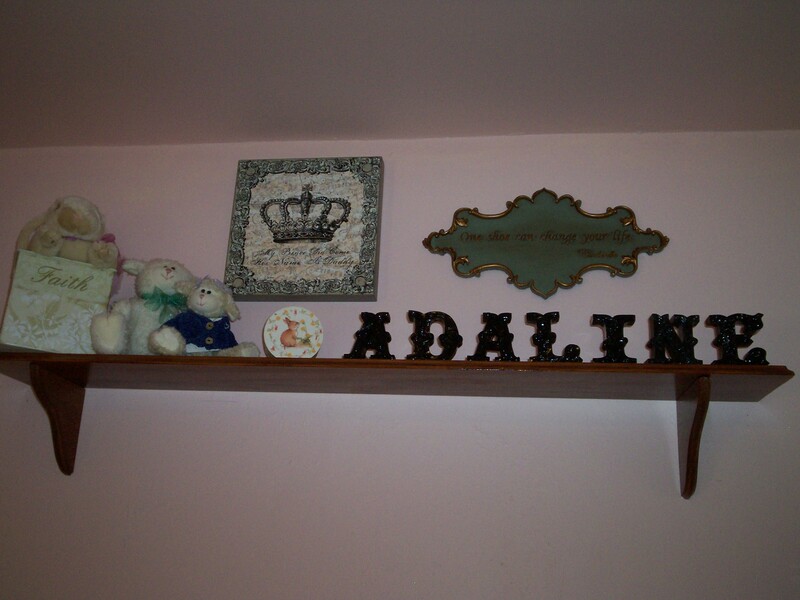 The bunnies on the right were from a local hobby/antique shop. The rose topiary is one of the centerpieces from our wedding. The Wish Sister was a birthday gift for me from my dear friend, Sara. The “I love you to the moon and back” sign was from Kirkland’s. The little lamb is a Boyd’s that I’ve had for years. The framed outdoor scene is a chalk drawing my sister made for me when she was about 10 years old. 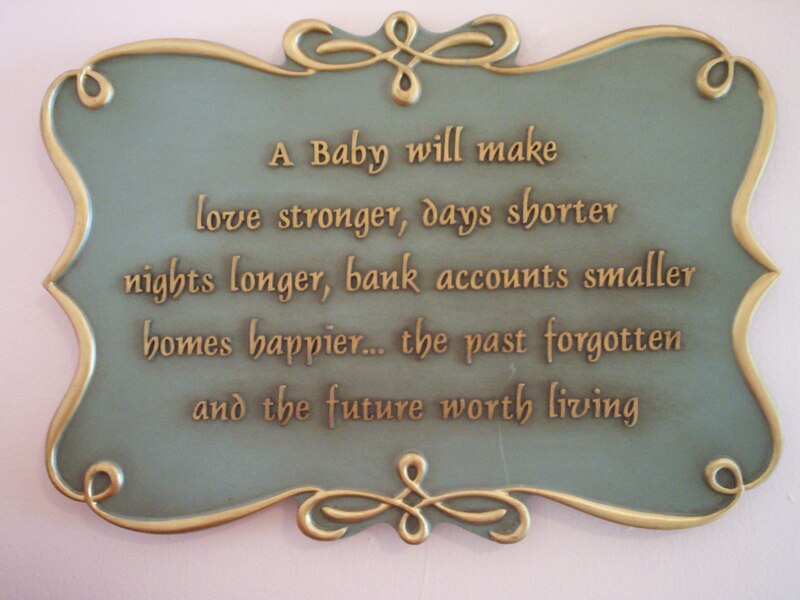 It hung in my bedroom until I got married and now it’s in Adaline’s nursery. The “Diamonds may be precious but daughter’s are priceless” photo frame is from The Hobby Lobby. It contains one of Adaline’s 3D Ultrasound images from 33 weeks. The three hanging letters with scripture “Pray, Daughter, Blessings” were from a Bible bookstore. The dresser is from my set of furniture when I was a baby. Yes, it’s held up 30 years. Over to the right is a set of handprint kits that was a gift from my mom. Each tin includes the materials to make a handprint impression from ages 1 to 5! We still need to do Adaline’s first year handprint…something we haven’t had the chance to get around to yet. The princess piggy bank was a gift from my sister-in-law. I think that the metal “Dream” box was from Michael’s. The bear plays a recording of Adaline’s heartbeat when she was 33 weeks in utero. When we play the recording for Adaline now, she thinks it’s a song and she starts dancing to it. So cute! The Philippians 4:8 sign is from The Hobby Lobby. 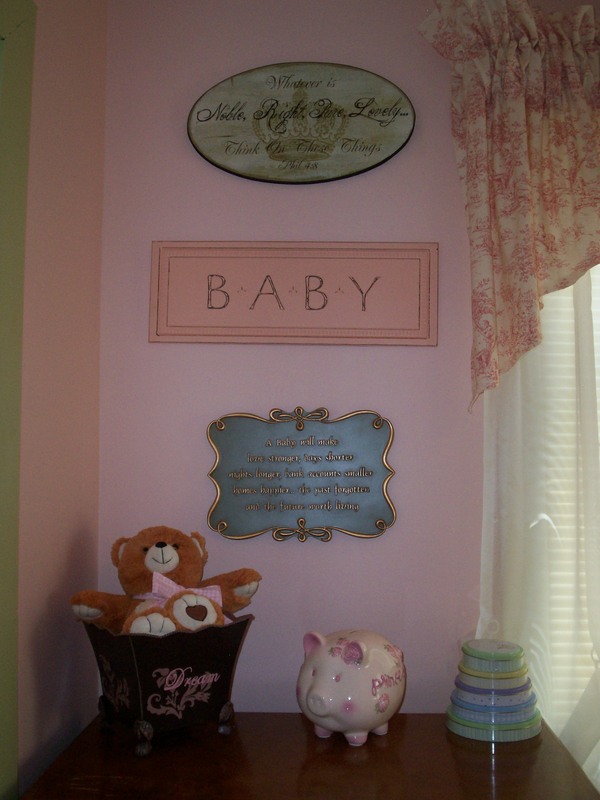 The pink baby sign and baby quote beneath it are from Kirkland’s. The wreath on the door was another centerpiece from our wedding (used as a candle ring for hurricane lamps). 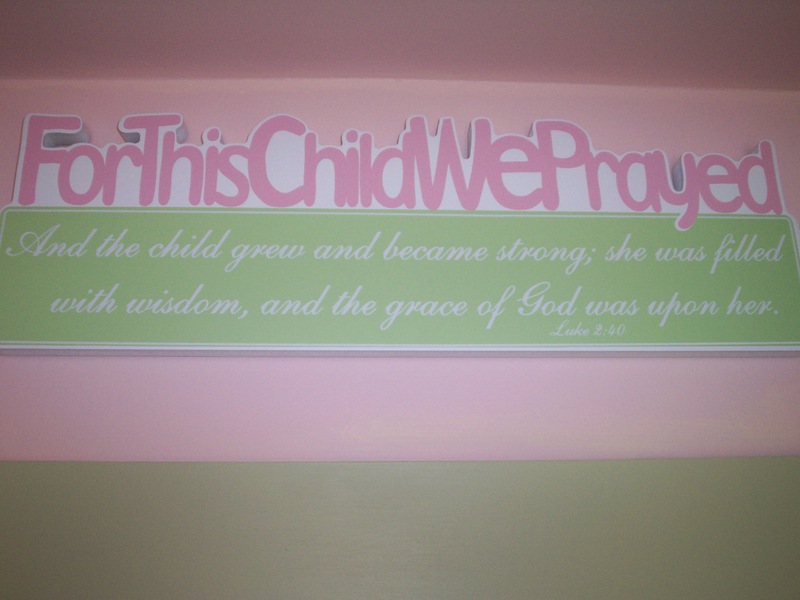 The “For this child we prayed…” plaque is from Family Christian Stores. 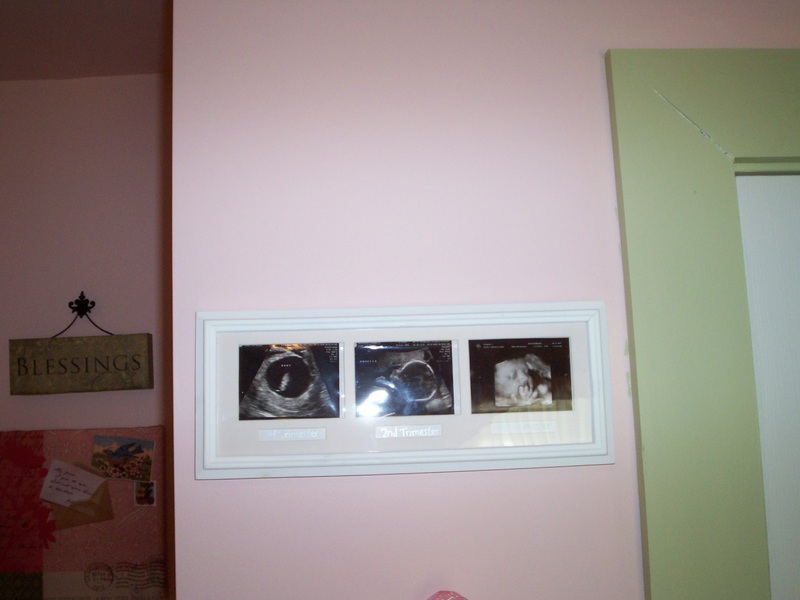 The white photo frame from Babies R Us contains an ultrasound from each trimester. 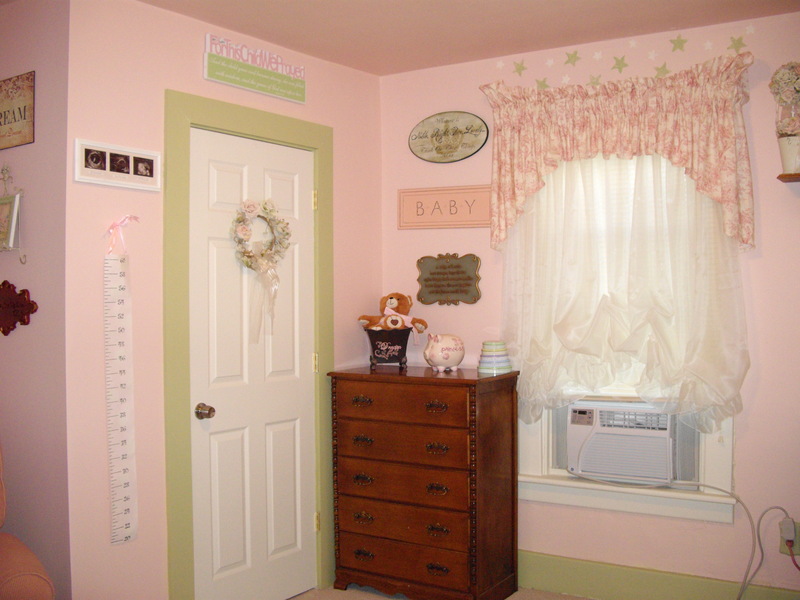 I saw the growth chart at The Hobby Lobby and bought it before I was even pregnant. The basket is from Michael’s. 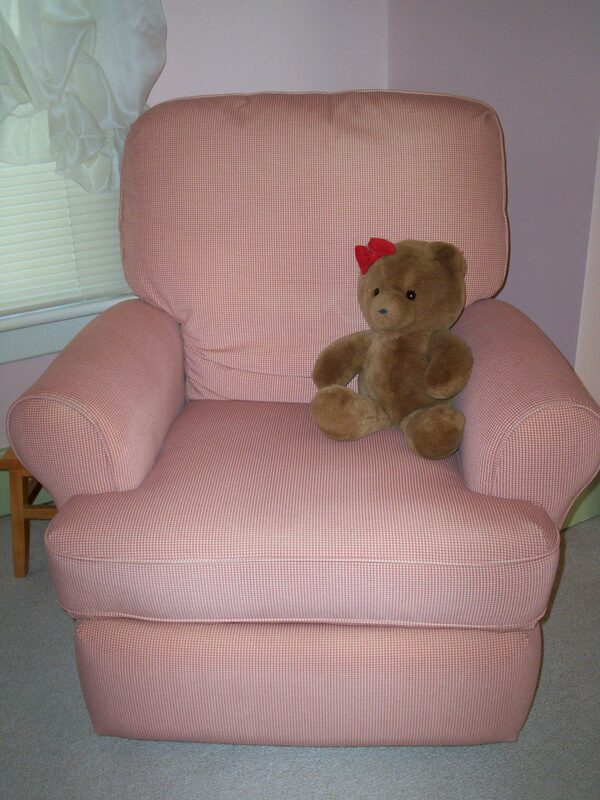 The glider/recliner from USA Baby was a gift from my mom, sister, and brother-in-law. Getting the fabric was a whole ordeal and a blog for another time. Just know that I wanted it to be green and fabric that I ordered was discontinued…twice. The adorable bear on the glider, Honey Jo, has been my pal for over 20 years. We found the toile fabric for the valances online. It’s the same pattern that’s on the Isabella bedding. The valances were made by my awesomely talented friend, Sara, who also made the rockin’ Happy Birthday sign for the front of the house on Adaline’s birthday. 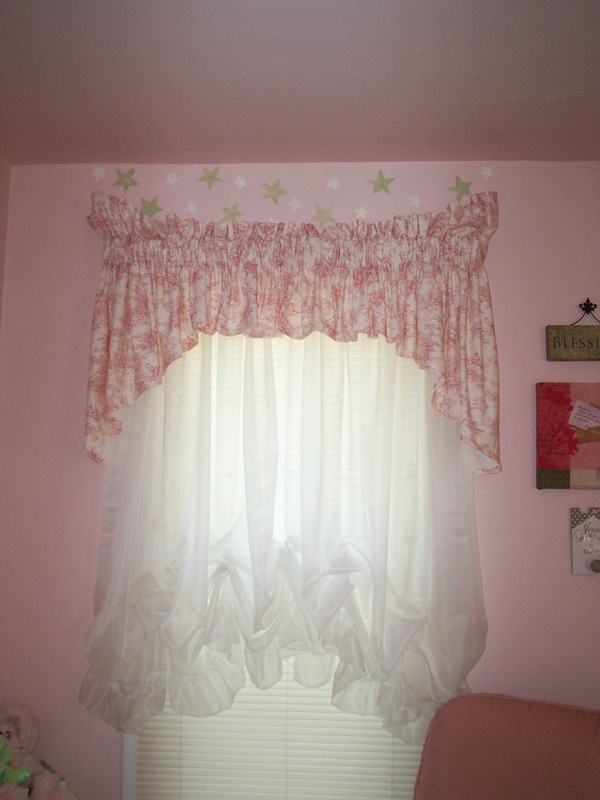 Because I thought the walls and valances were a little too much pink we got paint and sponges at a craft store and added the stars above all of the windows. There’s also a star pattern in the Isabella bedding. I loved the way they turned out. The wall décor pictured here was from The Hobby Lobby, Kirkland’s, and a Bible bookstore. The rocking and changing areas were one of the things that got moved around. We ended up needing more floor space for a swing and jumperoo so we had to move some things. 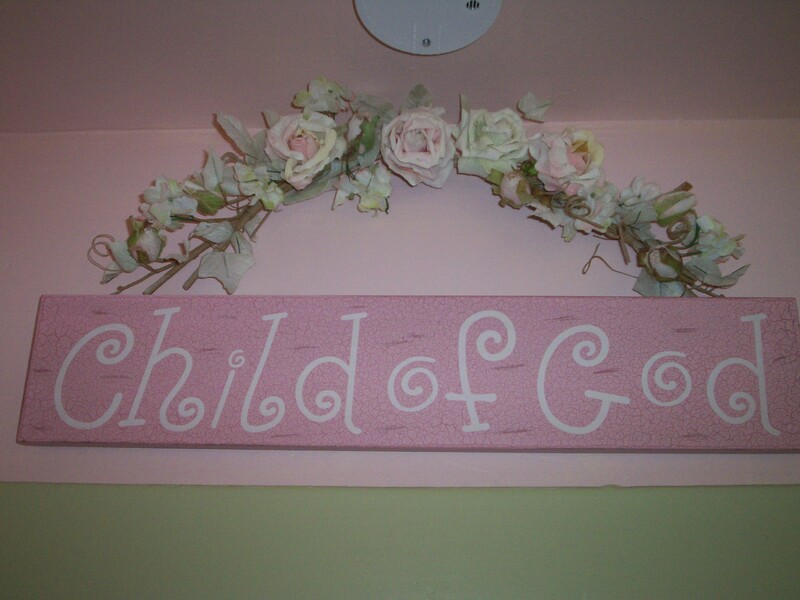 The “Child of God” sign is from The Hobby Lobby. The swag above it is actually another of the flower ring centerpieces from our wedding unbent. Although you can’t tell in the photo the switch plate has the same toile pattern as the valances and Isabella bedding in green. 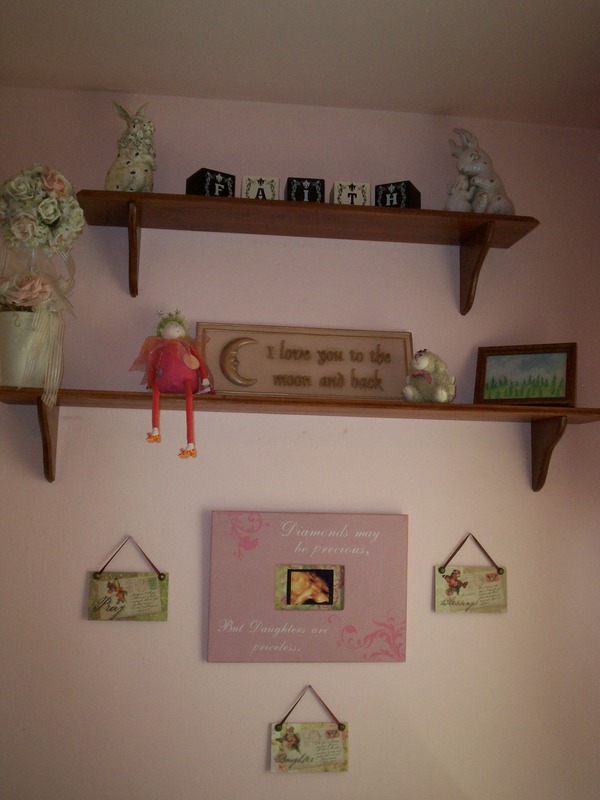 The shelves used to hang in my sister’s bedroom. The book shelves had been sitting around my mom’s attic for years. 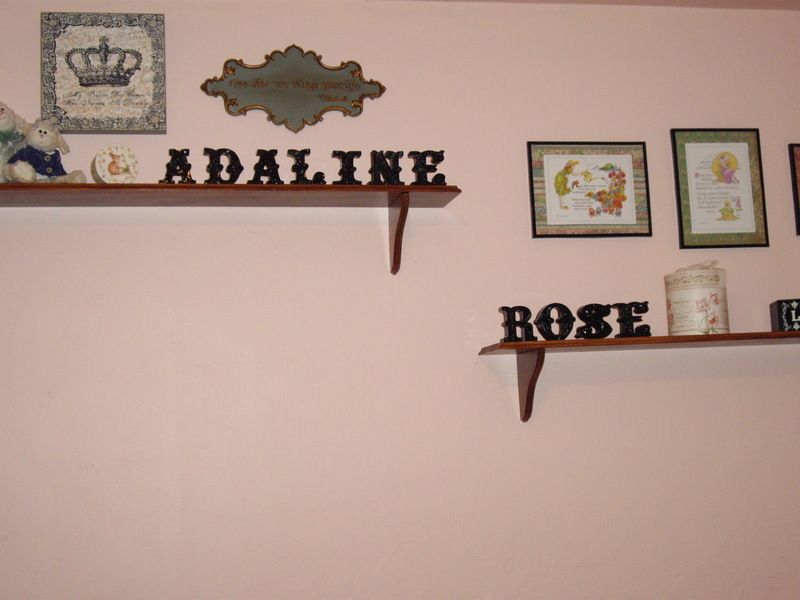 You may remember these black ceramic letters that spell Adaline from the mantel display at her first birthday party. 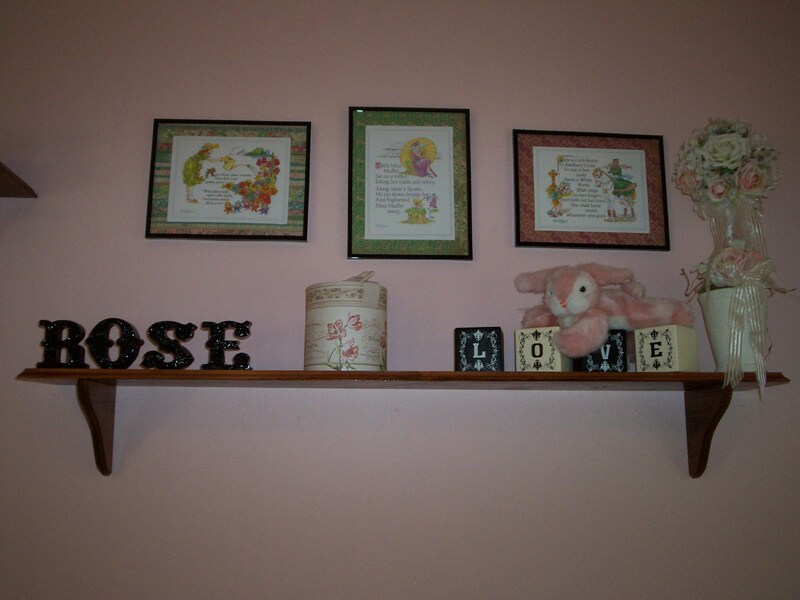 On the other shelf they spell out her middle name, Rose. I found these letters at the Hobby Lobby. 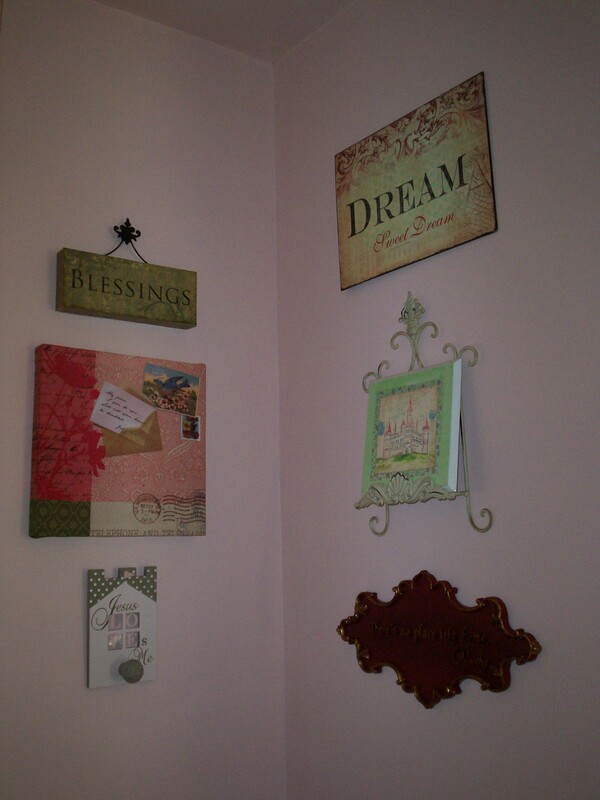 The “Faith” box and wall décor were from Michael’s, The Hobby Lobby, and Kirkland’s respectively. The bunny and lambs had been mine for years. I got the cute little round bunny box at a local hobby/antique store. The round box was from Michael’s, the “Love” blocks from The Hobby Lobby, another of my own bunnies, and another topiary centerpiece from our wedding. 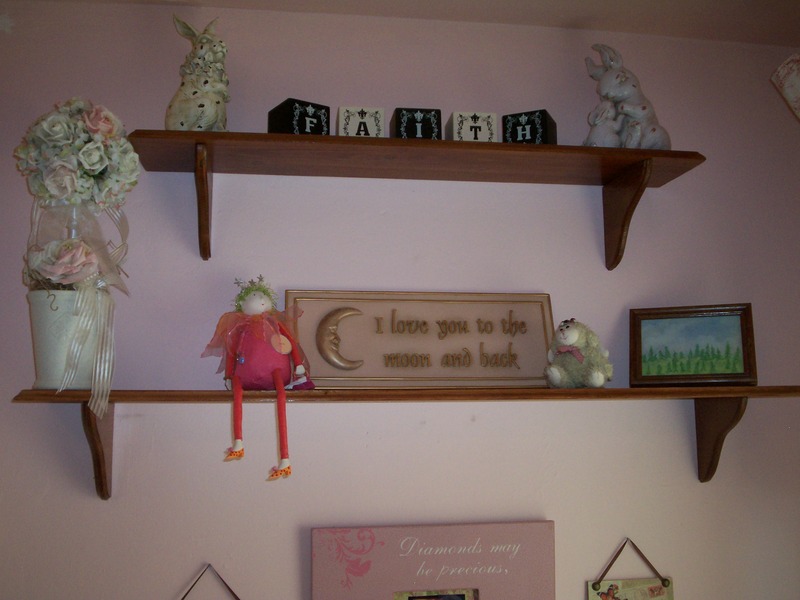 The nursery rhyme prints I found at Wal-Mart for $1.00 years ago when we first got married. We used scrapbook paper to matte them and I believe those frames were from something else that we no longer had on display. The giraffe was a gift from my mother. The brown bear was my very first teddy bear. 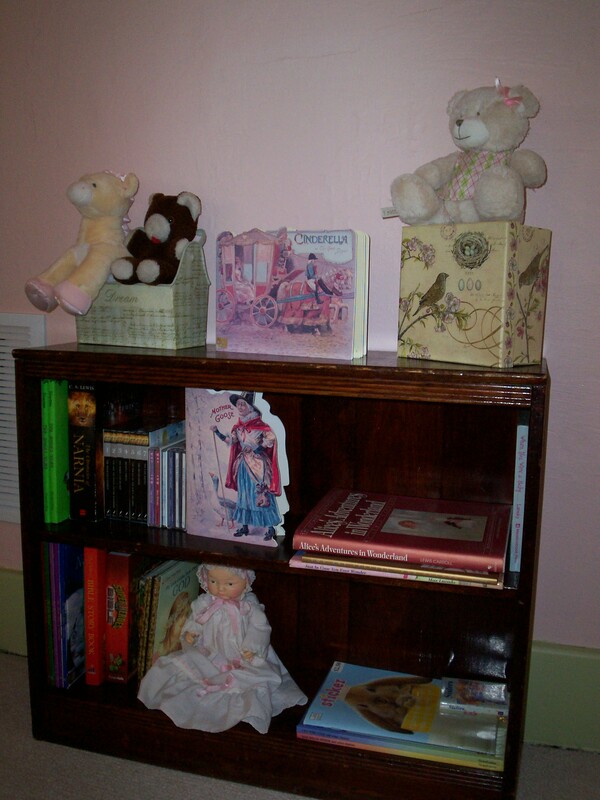 The Cinderella book (and Mother Goose book on the shelf beneath it) was from a local hobby/antique shop. The box was from Michael’s and the bear is Adaline’s first bear. Cool Daddy got it for her at Babies R Us. Most of the books and Bibles on the shelves we already had. The baby doll was part of my doll collection as a child. The cute wire table is from The Hobby Lobby. The stuffed bunnies were mine (Cool Daddy has gotten me one for Easter every year since we first started dating). The box they are sitting in is the box that her teddy bear came in. 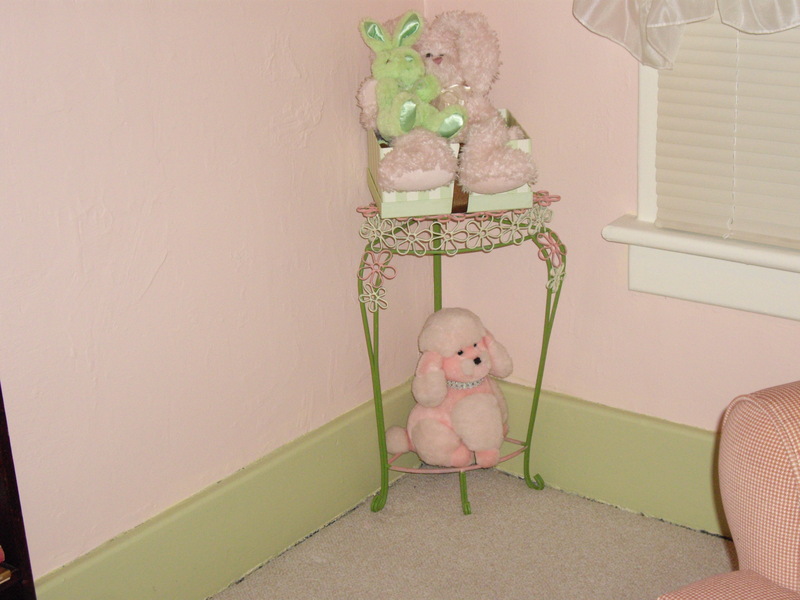 The pink poodle, FiFi, has been mine for about 20 years. Everything from The Hobby Lobby, Kirkland’s, and Michael’s was 50% off or on some kind of sale or clearance. Many of the items were reused or repurposed items that we already had. Many things were gifts. Very few items were purchased brand new at full price. Some things that aren’t “babyish” and that aren’t particularly pink or girly can be used as she grows older or used elsewhere in the house if her color scheme changes. I’m sure hoping that she’d like to keep it like this for awhile. I hope you enjoyed it! 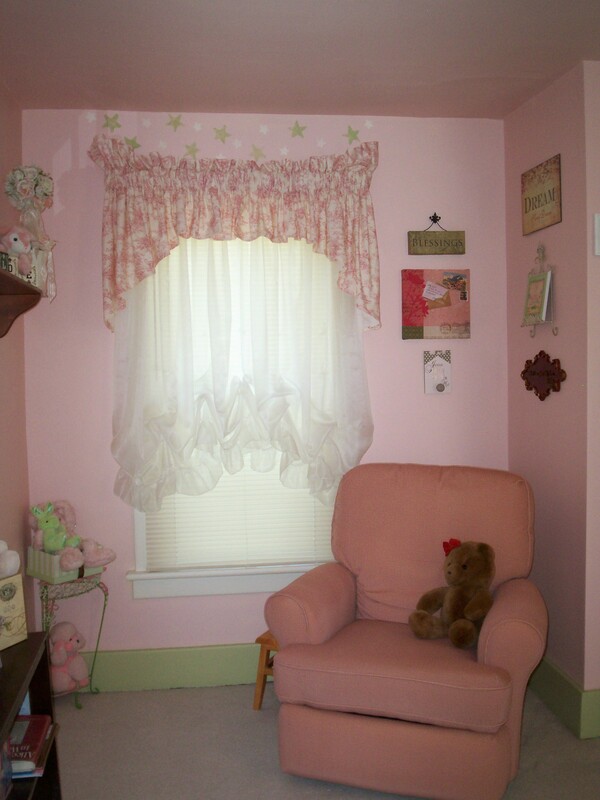 Posted on August 26, 2010, in Open House and tagged girly, nursery, photos, pink and green, topiaries. Bookmark the permalink. 12 Comments. So cute and sweet. I love the idea for quilt. Very pretty.You are a very savvy shopper.I bet her room was a lot of fun. I LOVE Hobby Lobby and Michaels! A JoAnn’s Fabric just opened in our town, and I need to make a plan to check it out. Very sweet room! I love that rocker! It looks like you could lose a day just rocking your little one!! Thanks, ladies! 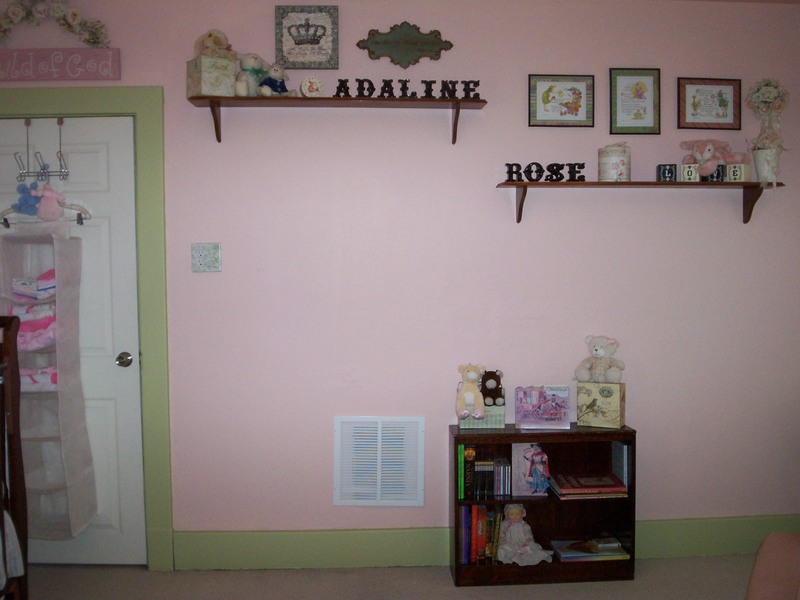 It was really fun putting together Adaline’s room. Of course, since I was pregnant all I did was pick everything out and my mom decorated everything! I love The Hobby Lobby, unfortunately it’s an hour drive away from here so I’m sure that I miss out on some good deals. They have a JoAnn’s right down the road from The Hobby Lobby, although I never go in there much. Next time I’m out that way I’ll have to look around. Thanks again for stopping by, ladies! Thank you! 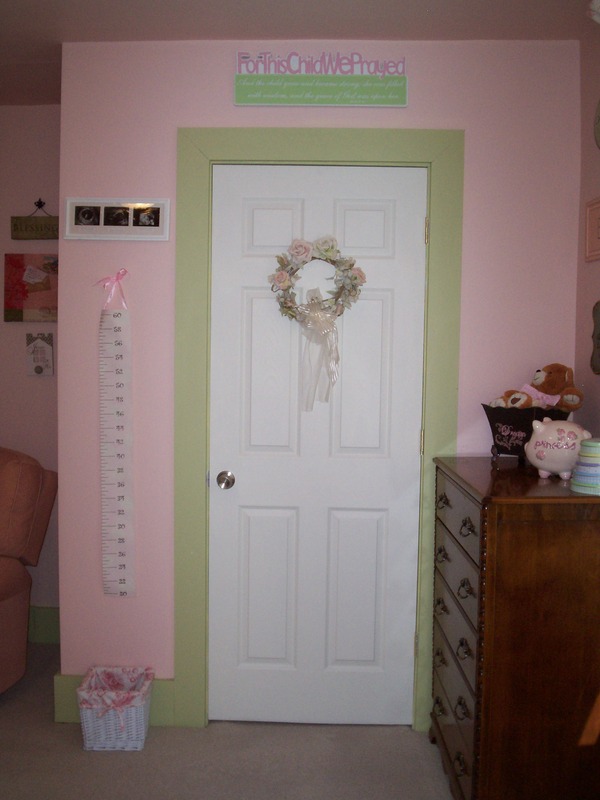 I love pink and green too, maybe too much evidenced by her nursery AND 1st birthday party. 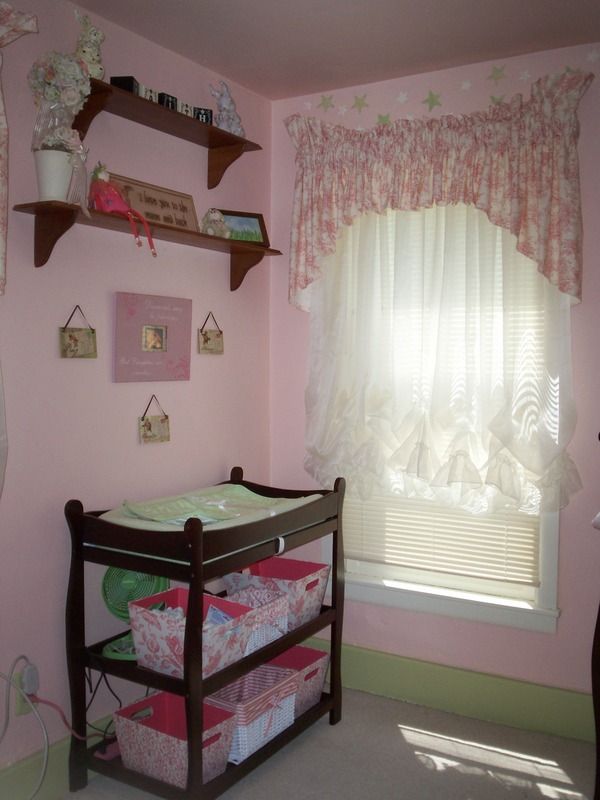 But there’s just something about those sweet girly colors that make me smile and want to have a tea party! Sissy, that To Do list is ridiculous already! But you’re right, we need to get that handprint made! Maybe we should do it on Saturday when the CoolFam is all over for “Too Long Turkey”/”Fake Thanksgiving” Day. This is darling! I am so impressed! I love it. What a good decorator’s eye you have! I am glad you linked! 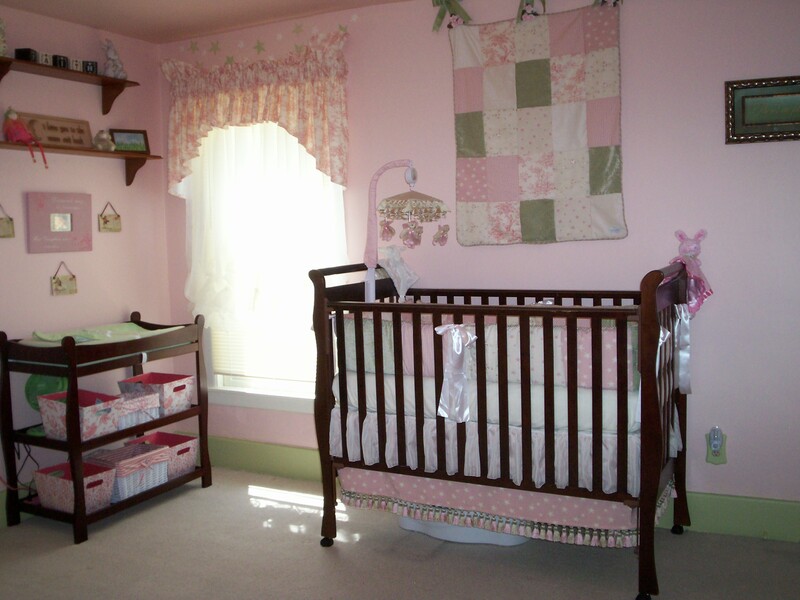 And what counts isn’t how many children you have, but that we love the ones we have.=) I can really see your love for your little girl in this precious room. 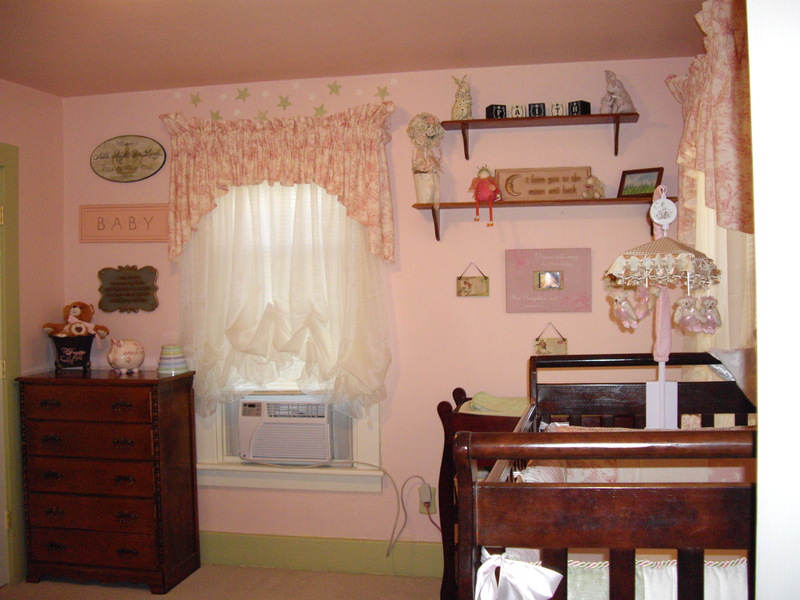 I love the Nursery. I love the colors:) And the quilt! And your rocker looks so comfy!! How precious – I love the thought you put in to every piece! 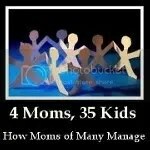 I found you through BlogFrog (somehow) and ended up here to find you linked to the 4 Mom’s Open House series!